iPhotDraw, a Free Picture Annotation App created by Simen (Yimin) Wu, can quickly markup pictures, photos, or images. Add text to pictures, tag people or things in a photo. 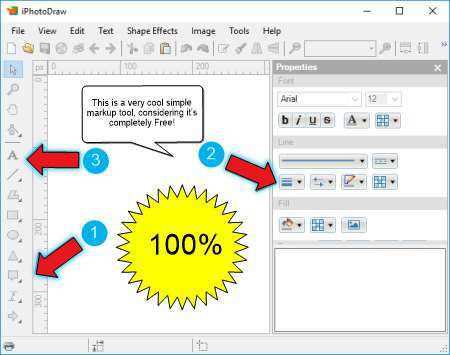 Add message bubbles, annotation arrows, numbers and letters to screenshots or instructional images. The tool also contains features typically only found in paid software. You can also edit image dimensional size + quality and then export those images as jpg, or png files. In addition, there is an option to save each project as an idpx file that work similar to the psd files Photoshop uses. Likewise, the idpx feature allows you to go back and edit or change the annotations made to an image by reloading its related idpx project file. As usual, iPhotoDraw can be stored and also run entirely from a USB Flash Drive. During my review of this Free Annotation Tool, I used it to quickly create the screenshot you see below.